In today’s post: If you’ve been intimidated by finger knitting (or any knitting) in the past, this post is for you! 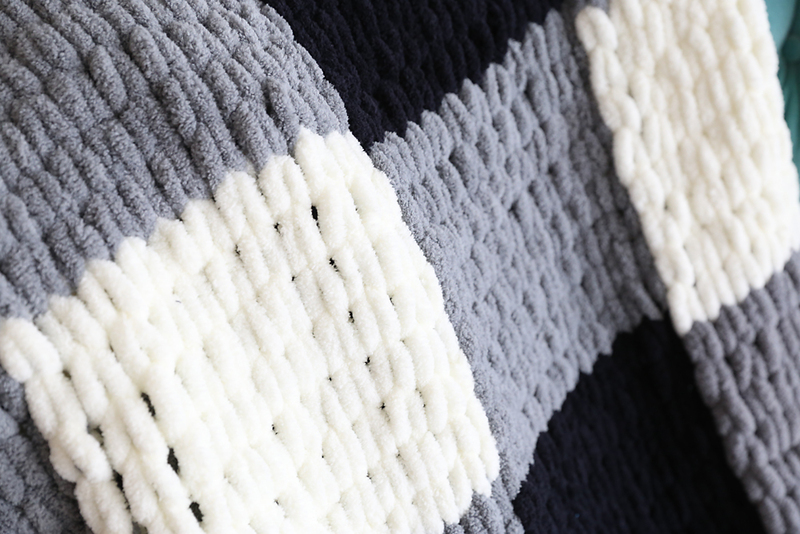 Anyone can use loop yarn to make a gorgeous finger knit blanket without knowing how to knit. So I’ve stumbled on a new craft product that I’m super excited about. At the craft store a few weeks ago I found this crazy looking yarn with all these loops on it. I was wondering what in the world it was so I picked up a package and oh my goodness it’s the softest thing I’ve ever felt. Just so you guys know, this post is not sponsored – I just really enjoyed working with this stuff and wanted to tell you about it! I’ve been wanting to learn finger knitting for a couple of years, but it always seemed intimidating – one more thing to learn, you know? But loop yarn makes finger knitting absolutely foolproof. This is knitting for dummies, and it’s really fun! 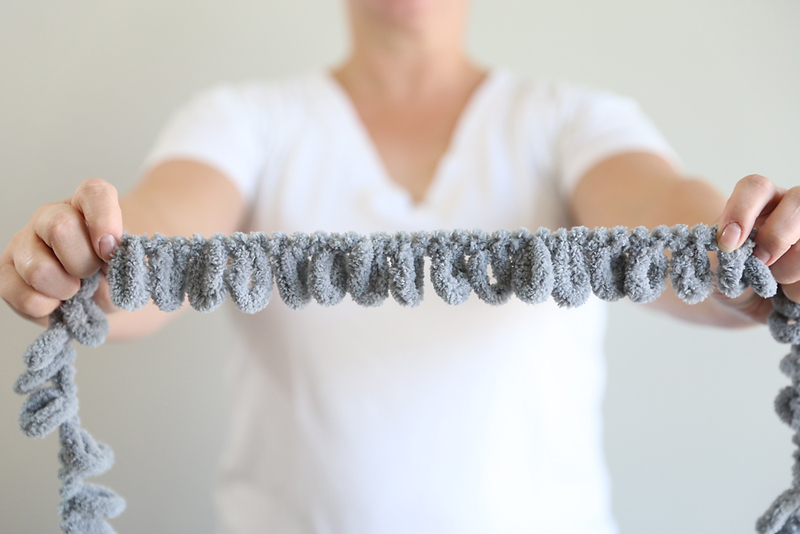 Right now there are at least four different brands making this type of loop yarn and you can find it at both Jo-Ann Fabrics and Michaels (and probably other stores that carry yarn). I’ve been using the Bernat Alize Blanket EZ yarn from Jo-Ann’s because there are fantastic patterns and instructions online for it at Yarnspirations.com. Like any nice yarn, it can be pricey to get enough for a large blanket, but it’s been on sale pretty regularly, and I was able to buy most of mine on sale with an additional 25% off coupon. Jo-Ann’s carries another brand called Loopity Loop Yarn and Michael’s carries the Red Heart brand version. ETA: it looks like Jo-Ann online is now carrying a version made by Lion Brand which is lower in cost than the other options, but I haven’t tried it so I can’t compare quality. Anyway, one of the reasons it’s so easy to learn how finger knit with loop yarn is that you don’t need knitting needles or crochet hooks, just your fingers. 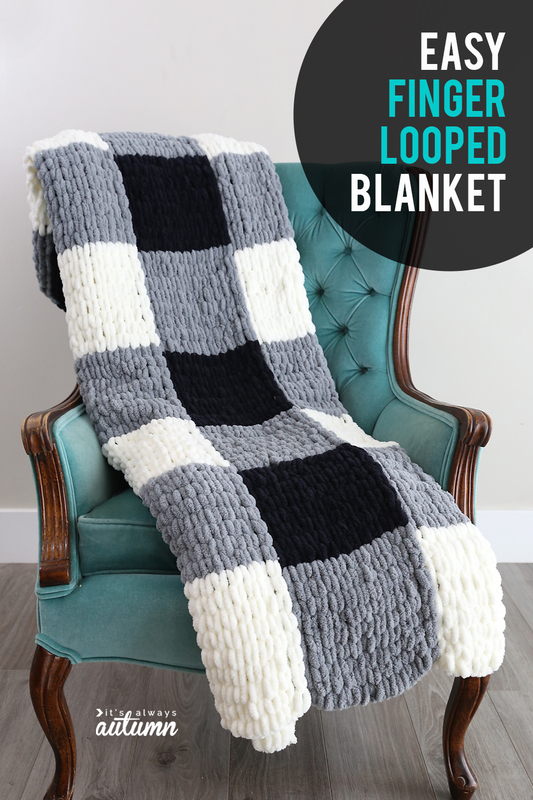 Basically, you pull one loop through another to “knit” the yarn into a blanket. The first project I made with this yarn was a baby blanket. It takes three balls of yarn, and probably took about 4 hours to make (I made it over a weekend while watching TV). 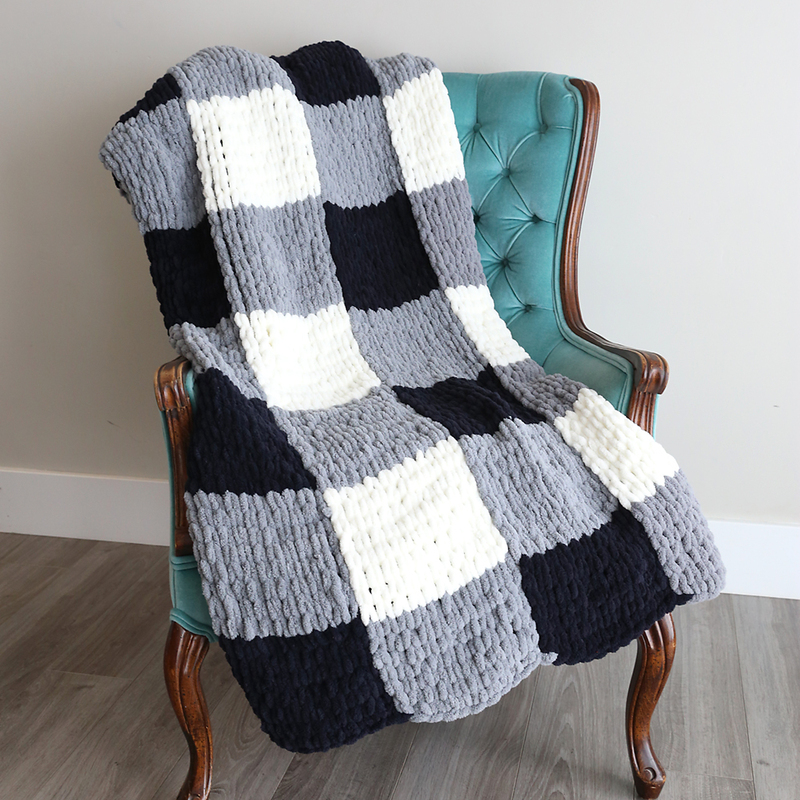 My next project was this plaid blanket. You can find the pattern for the blanket here. 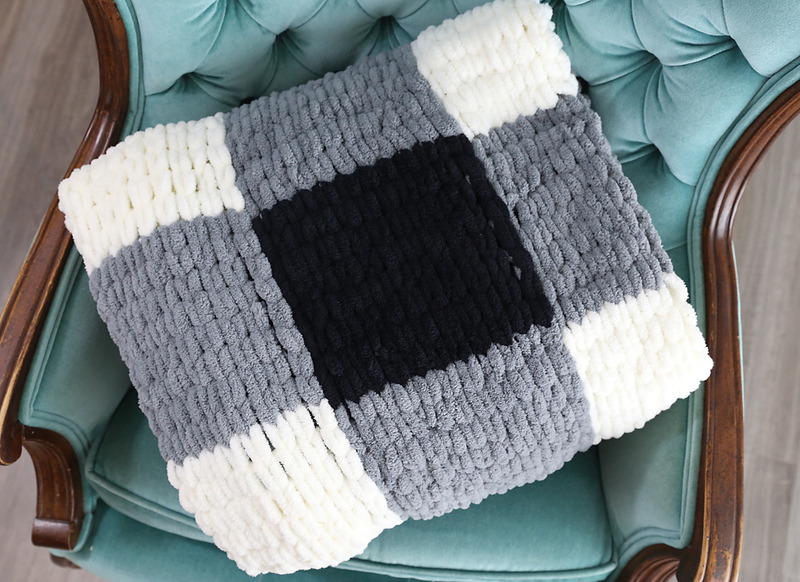 It uses the same easy finger looping technique (stocking stitch), but you make squares of different colors and connect them together as you go. This makes it a bit more complicated, so I’ve made a walk-through video to help you figure out the different steps if you’d like to make one too. The video is about 10 minutes long. Note: When weaving in the tails, I did find it faster to use a crochet hook. It’s not necessary, but does make that step go a little faster. I didn’t keep track of the time I spent on this blanket but I’m going to guess somewhere around 15 hours. All of that time was while watching TV, listening to an audio book, or chatting with my family. It’s so relaxing to sit with this super soft yarn and finger knit it together! My kids are obsessed with the finished blanket. 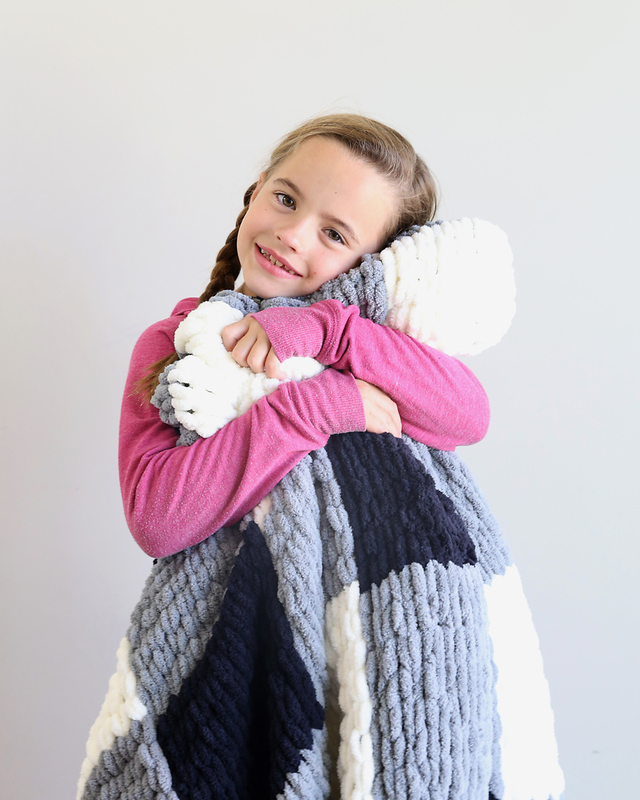 It’s very soft and very warm, and it’s gotten a ton of use at our house already. Luckily, the yarn is machine washable and dryable so I don’t have to stress about it getting dirty. Besides the basic stitch, there are other stitches, like a criss cross stitch, that you can learn to vary the look of the finished blankets. I can’t wait to try them out! « How to play MASH + a free printable game sheet! I don’t see a link to your video. Am I just missing it? scroll up until you see You can find the pattern for the blanket here. Find the pattern for blanket here will be in a very light blue. Wow! So pretty! I had not seen this before. Love the Buffalo Plaid look! Im trying this! Thanks!! What is the size of the blanket you made? How many Loopty Loop yarn did you use? The directions show 52 inch square. 7 x 7 squares. 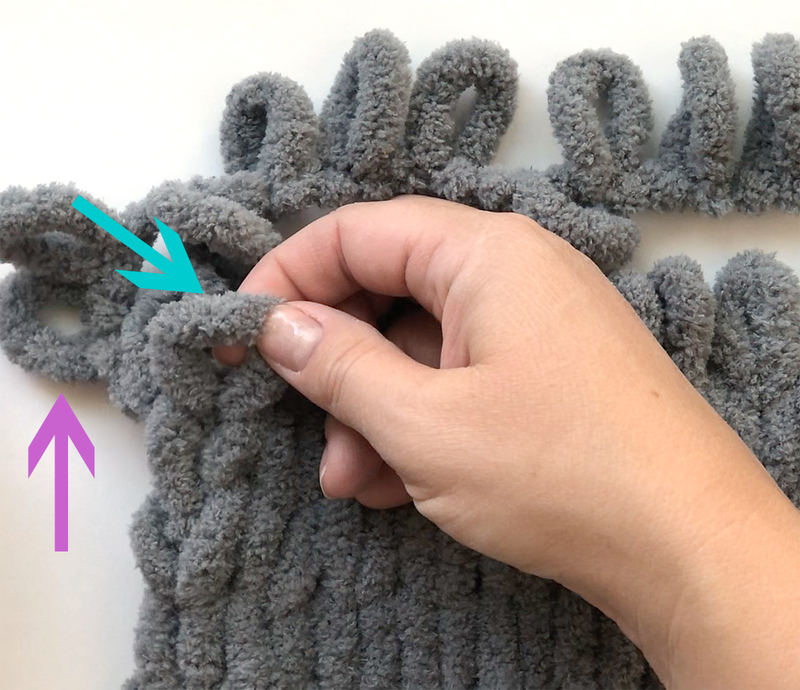 How many balls of the finger loop yarn did it take for the blanket in the video? Wow, thank you for sharing that! Can’t wait to try it out. I was forced to use Joann’s Loopity brand for white because my store didn’t carry the Bernat in white. It is terrible! It shreds, it falls apart if you tug it at all. Avoid it at all costs! But, the rest of it worked up quickly and I love it! Everyone on my list is getting one of these for Christmas this year! Thanks! Omg! How absolutely lovely. I am doing this very soon. Questions- how many completed strips vertically and do 8 blocks make one strip? This looks absolutely amazing. I was looking for something new to make my new great grandson a soft blanket and my granddaughter and I scarves. This is perfect I can’t wait to try it. Thank you so much! Please share the amount of yarn for the buffalo plaid blanket. For Christmas I’m going to make this beautiful blanket for my 16 yr old granddaughter. Something she can keep long after grandma is gone. Thank you so much Autumn . I’m confused about attaching when changing to a new color. I’m not sure how to tie-off and begin with the new color. I’m obviously doing something wrong. Same here. How do you tie the 2 colors together WITHOUT them coming untied when you wash the blanket. Always have trouble with this!! How many packages of tarn did you need to complete the blanket? How many squares did you use for the entire pattern? It looks amazing, would love to try. Would I be able to make one if I can’t crochet. Love this !!! I did a baby blanket as well in December for the arrival of first grandchild! Everyone loved how soft it was! So I was at Joann’s and bought more, thank you for sharing your pattern as I was trying find a pattern for adult size!